If you color isosceles rectangular triangles with n colors at the three sides you get n^3 one-sided and (n^3+n^2)/2 two-sided distinct pieces. 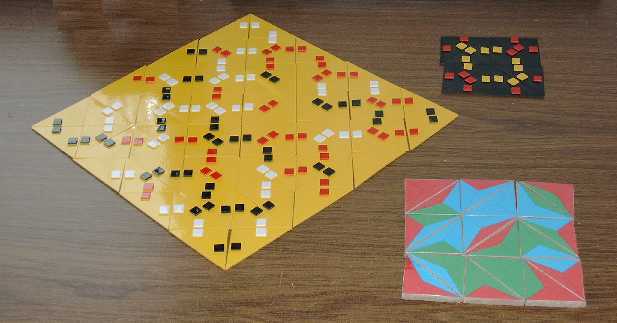 With a complete set of one-sided pieces it seems to be possible to construct n congruent triangles with n^2 tiles, where each triangle has a different border color. For n=2, 5, 6 the constructions are shown below, for n=8 look at the title and for n=1, 3, 4, 7 the construction is possible as well. So far I haven't seen a solution for n>8. Would you like to write your own program to get a solution? May be there is a systematic approach for a construction. Various rectangles, triangles and replicas of polyabolos can be found. If the number of long sides with same color is odd, these edges can't match and you have to look for multiple figures as shown above or you can choose pairs of different edge types (silver marked) instead of edge colors (yellow marked). With such pieces n-fold replicas of n-abolos or n-tans may be possible even if n is odd. Pieces can be cut from place mats giving some nice puzzle you can easily solve.